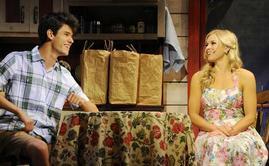 The Bucks County Playhouse production of The Summer of ’42 ambles along amiably, less romantic and atmospheric than comic and callow, when, suddenly. In the last major scene, the climactic scene if you will, it transforms itself into a rich drama with all of the intensity and all of the depth of character that had been noticeably absent . Miraculously, a missing quality appears, right before us, in moving loveliness. Where had it been until then? The contrast between that scene and the rest of the performance is striking. It’s as if director (and writer) Hunter Foster finally found the right tone and as if leading players Chris McCarrell and Chelsea Packard discovered the hidden core that drives their characters. You want the critical scene of a play to be poignant. You want all you’ve seen to coalesce and allow you to bask in the warmth, or whatever temperature is appropriate, of the material. That final scene was beautiful, perfect in mood and execution, representative of all the aspects that had been eluding the production. It sprang as a surprise, a pleasant one, a touching one, and again I have to ask why this level of theater was not evident all along. I don’t want to give a gloomy impression. The Summer of ’42 is never boring or unentertaining. This musical version of the famous 1971 coming-of-age movie by Robert Mulligan, holds interest and has jaunty summer stock appeal. The production just doesn’t engage your heart or mind. It moves along in a matter-of-fact fashion that is more narrative than dramatic. More dialogue or different direction of the leads, particularly the artful McCarrell, could have provided the texture that doesn’t occur until the show is almost finished. Foster, as director, keeps thing light and prosaic. His staging is as breezy as the Maine beach where the show is set. It’s so sunny, it misses the shadows and thoughtful reflections that could add depth. Foster, who wrote the script, obviously thinks it and composer David Kirshenbaum’s songs are sufficient to tell the story of Hermie, the adolescent whose sexual and sensual nature is destined to awaken this fateful summer, the first of a war that will be fought for three more years. Of course, you need dialogue and lyrics to tell the story. You also need heart and a multi-faceted portrait of a boy dealing with the confusion and awkwardness of passing from wonder to experience, and they are not seen on the Bucks County stage this around. Most of the scenes remain flat, a surface view of events at hand. You watch the characters and take in their experiences with equanimity, but you see no highs and lows. McCarrell’s reactions and posturing as Hermie are all over the place. They don’t take full focus or evolve into a picture of budding understanding and maturity. Choices, whether Foster’s or McCarrell’s are often wrong. McCarrell’s Hermie exudes confidence when he should be ill at ease. One minute he’s a gawking boy whose eyes pop when he sees a girl, and the next he’s cool as a cucumber. The progression is right. The problem is a specific attitude is often taken at the wrong time. McCarrell needs to be guided more about when to act a given stance. He also has to ponder more about how the things that happen to Hermie add up to a boy knowing his mind and acquiring the sensibility that opens him to mature experiences. Hermie”s moments of cockiness, insecurity, and ease need to be chosen and orchestrated better. McCarrell is actor enough to play any of Hermie’s alternating feelings and behaviors, but he has to be told which Hermie to be and when. It doesn’t look as if he had enough help with this. Because of that, changes in Hermie are announced verbally more often than they are expressed dramatically. The audience gets information from the script instead of from the performance. More subtlety and reflection are wanted. As I’ve said, McCarrell has a lot of colors to his acting. He is obviously capable of playing a deeper, more complex Hermie, one who can telegraph his inner concerns. The last scene proves that. In this production, it’s a welcome exception, but it also shows what the actors, if coached, could have been doing all along. “The actors” includes Chelsea Packard, who like McCarrell, saves her best and most revealing moments for the end when the talents and subtleties of both actors should have been exploited from the beginning. Parker has the blond, full-figured all-American looks that would excite teenage boys who are curious about the new attractive woman in their midst. Although the boys talk about the woman’s age, they are aware of her beauty, especially Hermie who is drawn to the woman, Dorothy, on first sight. Parker is right not to assert an air of mystery too soon. Her allure needs to be more in the eye of her adolescent beholders. At the same time, she needs to do something to attract Hermie as much as she does. Parker plays Dorothy like the friendly girl next door. She understands the difference in her and Hermie’s ages and does nothing to arouse or encourage him. But she has to exude more unconscious charm than she does to make her Hermie’s secret romance. Like most of the production, Parker’s Dorothy should be more evocative. I’ve gone into such detail because I care about the revival of Bucks County Playhouse, and I care about this show. Nothing was incompetent or clumsy. I just believe the overall theatrical experience could have been richer with more attention to nuances. I stand by all my comments and criticisms, but they didn’t keep me from enjoying the show. I just saw how it could have been better. I began by saying The Summer of ’42 is amiable. Much of what happens among the 15-year-old boys and girls is recognizable and universal. Many of us are aware of what it’s like to be a teenager on the brink of young adulthood, hungry for experience and longing for that summer, or any season, when we evolve from playing baseball games on the beach to trying to get to second base with a date in the darkness of a movie theater. That longing occurs to girls as well as to boys, and The Summer of ’42 understands and chronicles the plight of teenagers. 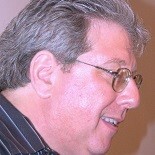 David Kirshenbaum’s music for The Summer of ’42 is typical of the light melodic scores of the current period. Kirshenbaum’s tunes are pleasant and soar to higher ground at times, for example in the soliloquies sung by Dorothy. His lyrics are better than average, if usually more narrative than poetic, and they are often amusing. Dorothy’s “Losing Track of Time,” sung wistfully by Packard, and the first act closer, “Someone to Dance With Me,” are especially good. I found myself humming the latter at intermission. The numbers I enjoyed most were 1940s-style pastiches a trio of girls sang at regular intervals. The Andrews Sisters-like tunes acted like a chorus that commented on situations and attitudes. These songs capture the time in which the musical is set and served to show off the singing and dancing talents of Bailey Buntain, Betsy Hogg, and Alyssa Gagarin, all of whom acquit themselves well as actresses playing the girlfriends of Hermie and his crew. Buntain may be most overall successful performer in the production. She stands out as a dancer in the trio numbers and is effective and affecting playing the girl Hermie is allegedly romancing. The Bucks County Playhouse has been resuscitated as a major cultural force. The renovation of the theater and the quality of its production values are to be admired for their taste and thoroughness. Those production values are quite evident in The Summer of ’42 which boasts a lovely, inviting seaside set by William Chin and David L. Arsenault, witty costumes, especially for the trio, by Nicole V. Moody, perfect lighting design by Travis McHale, and a fine live band led by Paul Masse. This entry was posted on September 3, 2013 by nzoren in Theater Reviews.